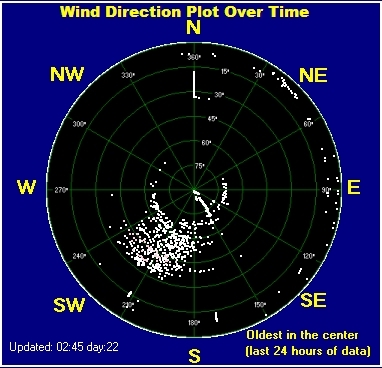 The following diagram plots the wind directions recorded over the past 24 hours and shows the prevailing direction over that period. A straight-line plot means either no wind, or as at the time of writing, a layer of snow on the wind vane! Odd single dots in strange directions should be ignored, the wind vane can swing about a lot, especially in very light winds.